May 10th is the day to celebrate mom and all she does! Don’t worry about cooking or cleaning, let us do that for you. We will be serving up a fabulous brunch just for the day. Our chefs have prepared a wonderful menu, with some of our favorite salads, appetizers and entrees. Plus some great egg dishes as well! On Mother’s Day reservations will be required, so make sure to save a table. You can make reservations online; just visit our home page monkeycat.com and click on the “Make Reservations” tab. On Mother’s Day we will be making so new spring cocktails, and serving up some classics such as Mimosas & Bloody Mary’s. 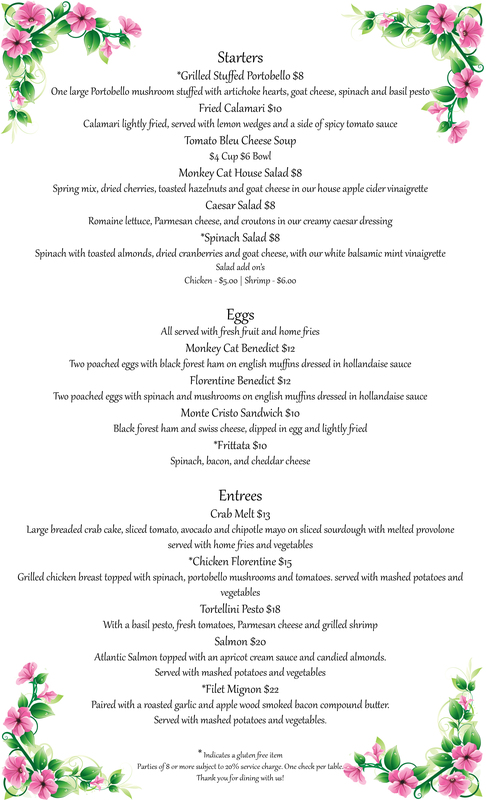 We have gluten free & vegetarian options on our Brunch Menu for Mother’s Day. We will not be serving off of our regular menu. Stay in town this Mother’s Day and treat your mom, grandma, sister, or aunt to a great Auburn brunch. We can’t wait to celebrate this Mother’s Day with you! Stay local this holiday season – Support Local Businesses – Eat Local Food. to see what else Auburn has to offer! No Replies to "Mother's Day"